In the wake of the flash floods that hit the heart of Johor Baru on Nov 16, followed by another smaller flood on Nov 24, MP for Pulai, Datuk Nur Jazlan Mohamed, made a recent working visit to the Sungai Segget site project. The RM240 million Sg Segget project, is one of the initiatives of Iskandar Regional Development Authority (IRDA) under the JB Transformation Programme that aims to sustain the city as the capital of Johor by providing economic activities, city living and amenities that are aligned with the vision of Majlis Bandaraya JB (MBJB) and Iskandar Malaysia. At the IRDA Project Management Office (PMO), Nur Jazlan, who is also deputy home minister, was briefed on Phase 1 of the project, which is the construction of the Sungai Segget Water Treatment Plant at the confluence of the Sungai Segget and Sungai Molek and Phase 2, for Sg Segget flood mitigation and the beautification of Jalan Wong Ah Fook. “As the principal coordinating agency responsible for the Sg Segget project, we feel responsible and are striving hard to alleviate the situation to minimize property damage and grief to businesses in the affected areas,” said IRDA Projects & PMO, Head, Mohd Zam Mustaman. IRDA Projects & PMO Sr Vice President, Abd Halim Mohd Nor, explained the technical details about the Water Treatment Plant and said that construction which started in June 2013 is now 47.30% completed and scheduled for completion by June 2016. Abd Halim announced that Phase 2 of the project which started in Jan 2014, is 54.10% completed now and due to be ready by June 2016. He also clarified that Komtar JBCC is situated in a water sub-catchment area and more prone to flash floods due to its gradient. While on-going upgrading work is in progress on the Sg Segget tidal gate, additional pumps and a generator are employed to help pump out excess water into the Johor Straits when necessary. Nur Jazlan agreed that the land reclamation work in the Johor Straits may have also affected the tidal currents and created more sediments at the river mouth which inadvertently causes poorer drainage run-off from Sg Segget into the Straits. When completed, the historical tidal gate will be upgraded to operate in tandem with an adjacent new pump sump and control house equipped with a SCADA (supervisory control and data acquisition) system that operates by automatic sensor response. In the course of the project, IRDA discovered that there are no blueprints for Sg Segget even when they checked the records with utility agencies like Syarikat Telekoms and Tenaga Nasional. “If JB aims to be an international city, it is unacceptable that the city does not have proper maps, plans and data on Sg Segget,” said Nur Jazlan who advised IRDA to work with MBJB to collect accurate data from the relevant agencies to be made available for better information and future reference. As a result of continuous heavy rainfall that coincided with a super high tide that peaked at 3.5m at 1.47pm on Nov 16, Jalan Meldrum, Jalan Siu Nam, Jalan Siu Chin and Jalan Siu Koon, as well as the stretch between Komtar JBCC and Menara Public Bank along Jalan Wong Ah Fook, were inundated by flash floods of up to 0.75m in depth. After similar rainfall recorded between 85mm to 75mm that coincided with super high tide of 3.5m that peaked at 9.45am on Nov 24, only the stretch in front of Komtar JBCC was affected by flash floods that measured 0.3m high around 10.45am but the waters subsided quickly. Tony Roma's JB crowns rib-eating champs! Tony Roma’s Johor Baru recently crowned the champions of it's first Rib-Eating contest here and rewarded each with a year of free meals at Tony Roma’s worth RM2,400. Eight female and eight male contenders bravely faced-off in this gastronomical feat in the finale of Tony Roma’s Rib-Eating Contest 2015 held in the concourse of Komtar JBCC. Tony Roma’s Malaysia has been hosting Rib-Eating contests in the Klang Valley for the past two years and this year was their third edition held at two selected outlets, Damansara Ara in Selangor and at Komtar JBCC for the first time. Contenders were picked to participate in the contest from diners at Tony Roma’s JB who submitted their entries for the Rib-Eating contest in the past few months. The eight ladies were challenged to eat Tony Roma’s Indulgent Beef Three, made up of three signature barbecued ribs, while the men competed with eating the heavyweight portion of Beef Ten, in the shortest possible time. Aalia Zaafira [2nd from Right] eating her way to win! Twelve-year old Aalia Zaafira, made a surprising win when she finished eating three Tony Roma’s ribs in a record 3 min 17 sec. This young, first-time contender said she prepared herself a day ahead and even worked out before coming for the contest. She was followed closely by Surinah Ahamd, 37, who completed eating her portion just 5 seconds later. Abd Halim Afandi, 43, emerged the ultimate rib-eating champion when he polished off his platter of Tony Roma’s Bountiful Beef Ribs – ten signature barbecued ribs – in just 13 min 31 sec! rib-eating champion in the face-off! Since Tony Roma’s opened in Komtar JBCC, he and his family have been dining here regularly because the delicious beef ribs are a firm family favourite. Tito Tovar, who hails from California USA, finished eating his portion of ten ribs in second place, just 10 secs later. “After receiving countless comments and requests about opening Tony Roma’s in JB, we are glad to see that this outlet in Komtar JBCC has a regular clientele who simply enjoy our food,” said Revenue Valley, franchise owner of Tony Roma’s, chief operating officer, Dickson Low, after presenting the prizes to the rib-eating champions. Tony Roma’s is not only renowned for their signature beef ribs but also for an extensive menu of seafood, steaks, chicken, lamb, salad, sandwiches and burger entrees with unique appetizers and mini dessert servings. “Our JB outlet is the ninth in the Tony Roma’s chain of restaurants and we have plans to open the second outlet here soon,” said Tony Roma’s marketing manager, Johnny Pan, who was clearly delighted with the enthusiastic response to the rib-eating contest in JB. Check this out! Tony Roma's Bountiful Beef Ribs - ten signature barbecued ribs! A crowd of curious spectators was inevitably drawn to watch the men's Tony Roma's rib-eating challenge! Thirty-two people in the first Talent Development Programme have successfully completed their training and are now employed in the Brandt International Global Business Services delivery center in 1Medini Hub, Nusajaya, Johor. This inaugural programme was carried out in partnership with Multimedia Development Corporation (MDeC) and i2M Ventures Sdn Bhd (i2M). This collaboration started with the agreement to create 50 jobs for Customer Management Executives in Medini Hub as this initiative will provide professional development and opportunities for growth in Iskandar Malaysia. “With this in mind, Brandt International made the shift to recruit candidates here and adopted the ‘hire and train’ approach in establishing the Global Business Services (GBS) centre in Medini, Nusajaya,” said Brandt International founder & CEO, Munirah Looi. “Moving to Nusajaya was a conscious strategy for Brandt to focus on near-shore market potentials and attract new talents here to be skilled for jobs in the Business Services sector, and today we see the fruits of our decision in this graduation event,” she added. Out of 200 applicants keen to join the training programme, only 32 candidates were shortlisted to undergo a month-long, fully residential programme with group activities and case studies. These candidates, including 21 Johoreans, were a mix of SPM holders with one year experience in the sales or service industries, fresh diploma and degree graduates and even early retirees who wished to relocate to Iskandar Malaysia. Each person in the group were presented with certificates in a simple graduation ceremony while top performers, Lata Kumarasamy, Mohamad Aizat Junaidi and Iza’in Mohamat Nor, were duly recognised for exceeding the set targets with their exemplary performance. These trained talents who have started their careers in the GBS delivery center in 1Medini Hub will have their performance monitored and further honed over the next six months. "The service industry is about people and when this one person in the delivery centre answers a call or message, he or she is the ambassador of the company,” said Multimedia Development Corporation Vice President, Global Business Services, Michael Warren, emphasising the importance of employing trained and skilled personnel in the delivery centre. “We would like to congratulate Brandt for a job well done in training and hiring these talents,” said i2M Managing Director, Zulfiqar Zainuddin, who went on to say that this is proof that there is untapped talent available in this region to complement the need for highly skilled people in the GBS industry. Brandt International has successfully designed, developed and implemented multiple solutions with thirty clients, primarily in Asia, the Middle East, the UK and US markets, and worked closely with i2M, a wholly-owned subsidiary of Khazanah Nasional Bhd, in the setting up of its delivery centre here. Brandt, a specialist in Business Transforming Consulting and Business Process Managed Services, has another delivery center in Bangsar South, Kuala Lumpur. 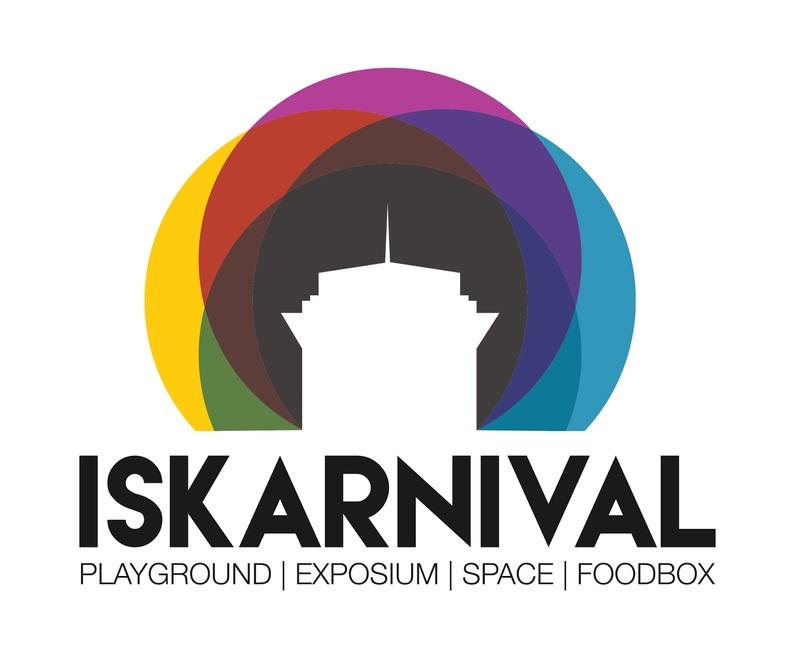 Iskarnival 2015, a community carnival by Johoreans for Johoreans, will take place on December 5 and 6 at Puteri Harbour in Nusajaya. This Corporate Social Responsibility event for the rakyat, is organised by Khazanah Nasional Bhd, Iskandar Investmant Bhd (IIB) and UEM Sunrise Bhd, for the fourth consecutive year. A programme of exciting activities is planned from 10am to 10pm on Dec 5 that will culminate in a colourful fireworks display. 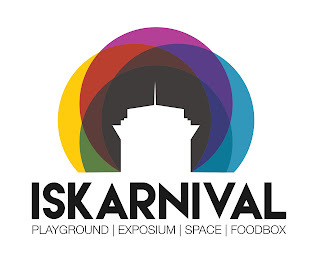 Iskarnival aims to promote the many lifestyle, work and business opportunities in Iskandar Malaysia. These will be demonstrated through seven components, namely the Exposium for properties, career and job opportunities, the Playground for kids and extreme sports enthusiasts, the Space for fun and traditional games, the Foodbox for food products, the Iskarnival bazaar, the Gego 2015 concert and Rimba-Rimba, the Green-living corner. “As the master developer of Nusajaya, UEM Sunrise is proud to be part of Iskarnival for the fourth consecutive year,” said UEM Sunrise Managing Director/Chief Executive Officer, Anwar Syahrin Abdul Ajib. “We meticulously plan our developments and build a strong eco-system to ensure that Nusajaya will grow sustainably for the long term,” he added. To create more awareness of a greener lifestyle, Johor Green will present a talk on sustainable eating at 2.30pm on Dec 5 and give away seed bombs and small plants for visitors to start their own gardens. Besides looking at inspiring landscape designs, visitors may shop for landscape plants, fresh organic produce and seasonal local fruits. "Social inclusiveness is the underlying objective of organizing Iskarnival,” said IIB President/Chief Executive Officer, Datuk Syed Mohamed Syed Ibrahim, who explained that they strive harder to find more ways to share the opportunities Iskandar Malaysia has to offer and added more initiatives and activities for Johor entrepreneurs to participate in this event. Some of the interesting highlights of Iskarnival 2015 on Dec 5 include a talk on Tips to Own a Home by Dr Azizul Azli Ahmad at 12.45pm, a FIFA match with JDT players at 3pm and live music entertainment by local artists in a concert with Akim & The Magistret, Aizat Amdan, Monoloque, Laila’s Lounge and Plague of Happiness. Fynn Jamal and M. Nasir will perform the next day. Visitors are advised to use the free bus service to Puteri Harbour arranged from three locations: Larkin Sentral bus terminal, Gelang Patah and Pasir Gudang, from 9am to 12am on Dec 5 and from 9am to 8pm on Dec 6. Do you know that Hospital Sultanah Aminah is now charging parking fees for vehicles parked in the hospital compound? I made this startling discovery in the wee hours of the morning recently when I sent a friend involved in a motor accident, to the Accident & Emergency department. It was past midnight and with the carpark understandably less crowded, I hoped to find a parking space quickly. But I was stopped by two carpark attendants sitting in semi-darkness and one of them handed me a carpark ticket. The A & E department, however, was jam-packed with patients. The Triage staff assessed my friend’s condition, which did not look critical, and advised us to go home and return in the morning as the wait for consultation was going to be long. We took their advice and when I retrieved my car to exit the carpark, the attendant asked for parking fees! I reasoned that we spent hardly a few minutes speaking to the Triage staff before we decided to leave and should be within the grace period. After conferring between themselves, the carpark attendants agreed to waive the fees. This was how I discovered that HSA was charging carpark fees. A few weeks later, I had a chat with my HSA doctor friend who confirmed that the hospital decided to implement parking fees after much deliberation. The parking situation was just getting impossible. Besides dealing with patients’ medical needs, the hospital administration had to cope with car-parking problems, not just with patients, but also among hospital staff! Inconsiderate parking that obstructed other drivers, caused tempers to flare and even the recently implemented car-parking fees, have not provided a viable solution to the parking problems. With too many cars and too few spaces, patients and visitors often find it impossible to get a proper parking space. The carpark in front of the A & E department is notorious for haphazard parking, typically with vehicles parked on the curb and over the landscaped garden! Staff parking spilled over from the staff carpark into the public section where the problem is compounded by spaces perpetually occupied by vehicles that everyone suspects, were parked early in the morning by car-owners who carpool or commute by public transport to work in Singapore. My doctor friend said that every morning, the road into the hospital compound from Jalan Mahmoodiah was choked with cars queuing to collect their parking tickets at that entry point into HSA. Cars backed up all the way to Jalan Mahmoodiah, often obstruct the vehicles of staff and patients who were turning into the road to the Mahmoodiah outpatient clinic. Patients, who can only afford to pay a nominal fee for consultation at the public hospital, are hopping mad because they now have to pay parking fees that are being clocked up by the hours spent in long waits in the hospital. As a HSA regular to collect prescriptions or accompany either of my parents for their clinic consultations, I’m familiar with the routine. We first queue to collect a number to join the queue to get the room number for consultation with the assigned doctor. After waiting to meet the doctor, patients would receive a prescription and they join another queue at the pharmacy to pick up their drugs. There are sometimes queues to wait for turns for a blood test or to take weight or answer questionnaires. Most patients are reluctant to pay the parking fees in the poorly designed carpark and end up feeling not only physically sick but also frustrated by the traffic congestion within the carpark. I’m sure car-owners would be willing to pay the parking charges if the hospital built a multi-storey carpark and had more orderly parking. I recently sent my mother to HSA for her eye check-up appointment at the polyclinic and after dropping her off at the porch, my car could hardly move because the queue was inching its way into a bottleneck to the exit. I spotted the payment booth at the far end of the porch while the signboard with parking ticket payment instructions was situated under some trees, between the booth and the exit. From my vantage point, I observed that drivers who realized too late that they could not exit because their ticket was unpaid, were causing further delay. They had no alternative but to leave their vehicles and go to the payment booth to get their ticket paid first. Drivers in a similar predicament, parked and left their cars indiscriminately along the road to get their tickets paid at the booth. It was a chaotic scene of tired, ill and frustrated vehicle owners trekking back to settle payments before they could drive out. The queue in front of me was not going to move within the 15-minute grace period and I did not want to risk reaching the exit only to discover that my ticket had exceed the time limit. It was better to be safe than sorry so I made the decision to leave my stationery car and run across the porch to the booth. parking fees while leaving their cars to obstruct traffic! I asked the staff about the validity of my ticket as I only did a “drop-off” and pointed to the queue in the bottleneck that did not look like it was going to clear soon. One of the staff who appeared reluctant to validate my ticket, consulted with another and they finally decided to do it. I saw sheets of laminated paper, printed with payment instructions and attached to the gantry arm at the entry points. But these proved rwather ineffective because it’s quite impossible to read when one was driving, taking a ticket and the gantry arm was raised! The carpark operator should put up signboards or posters with payment instructions at strategic spots inside the buildings to remind users about fee payment before retrieving cars. It’s a learning process for everyone and this information may be shared in conversations while waiting – and we certainly spend a great deal of time waiting here. I met Juliette Lai, a music conductor, composer, arranger and pioneer in music education, at several fund-raiser events. 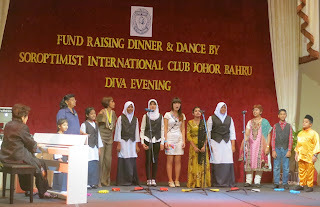 I remember an elegant evening where Lai, a member of the Johor Baru Speakers Club, presented a musical soiree dubbed JBSC Soiree Musicale, with the help of her musician friends from Singapore. At another event, Lai was a volunteer who trained students from learning centres established by Soroptomists International Johor Baru (SIJB) in partnership with the United Nations High Commissioner for Refugees for Rohingya refugee children, to present songs in English and Malay. The Rohingya Children’s Choir delighted the audience with their rendition of, “We Are the World” followed by local favourites, Lenggang Kangkong, Rasa Sayang and Geylang Sipaku Geylang. 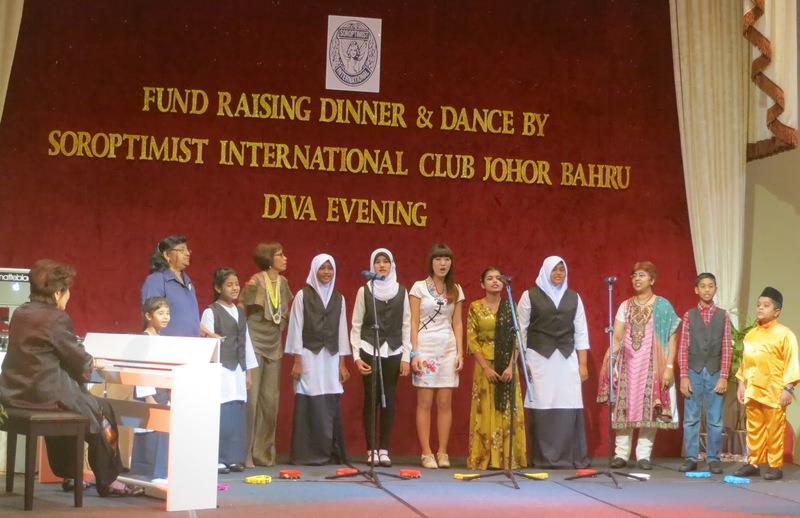 It was the students’ first time performing to an audience and they were encouraged by the support of several teachers with then SIJB President, Soraya Alkaff-Gilmour. The choir charmed the audience with their voices and I realised that Lai’s illustrious music career, developed in Johor and established in Singapore, was little known in her own country. It was only natural for Lai’s talent to be nurtured in Singapore, a city with a vibrant art scene that’s just a causeway away from JB. This year the city state celebrates its Golden Jubilee or SG50, with a series of events including those for art and music and Lai invited me to join her at the 5th Singapore Lieder Festival, Songs from Home, where some of her songs were performed. Besides the Singapore premier of her arrangement of, Menceceh Bujang Lapuk, her arrangements of Getaran Jiwa, Potong Padi and Burung KakaTua, were performed as well as a new arrangement of her composition, Dreams. As we crawled across the causeway in weekend traffic, I got to know this prolific musician better. Lai, the seventh of eight siblings, had her first experience with the piano when she was just 5 years old. She would stand and watch while her eldest sister, Pat, taught another sister, to play. When the lesson was over, Lai sat down at the piano and played what Pat had taught her sister! With her natural aptitude for music, Lai was encouraged to play the piano and she completed Grade 4 under Pat’s tutelage. When Pat had a job transfer to Penang, Lai stayed with her to complete her Grade 7 exam. When Lai moved back to stay with her parents in Batu Pahat, they did not have a piano at home for her to practice but a friend, who held the keys to the church, would open the church for Lai to practice on the church piano. This was how she practiced for one and a half months before her Grade 8 practical exam. At 17, Lai embarked on her Music Diploma with the first UK trained music graduate in JB and she would travel by public bus from Batu Pahat for her music lesson every weekend. Lai fondly recalls trundling along in the non-air-conditioned bus to JB, completing her lesson and having a noodle meal before catching a similar bus for her return journey. While Lai was a trainee teacher with a college in Kuala Lumpur, she signed up to do her second Diploma in Music under a Scottish tutor and examiner. The ABRSM scholarship, shared between Malaysia and Sri Lanka, was offered once in two years and when this was published in the newspapers, her father and best friend, applied on her behalf while she was teaching in Perlis. Out of the 40 shortlisted candidates, she was invited for an interview and was selected based on merit. Lai was recommended to receive the prestigious Federal Scholarship from the Malaysian Government to further her studies at the Royal Scottish Academy of Music and Drama where she graduated, winning prizes for Harmony & Counterpoint and for Best All-Round Student. While being Head of the Music Department at the Malaysian Teachers College (Maktab Perguruan Temenggong Ibrahim) in JB, Lai also served as Chairman of Committees for Curriculum Planning for Malaysian teachers colleges and Malaysian schools as well as Chief Examiner for the Malaysian O-level Music Examinations. School and college choirs and recorder ensembles she directed, won top awards at all competitions in which they participated at national level. While Lai lived and worked in JB, she joined the Singapore Chamber Ensemble where she sang and played the piano. Her gift in music was acknowledged by her appointment as conductor of the National University of Singapore Choir (1985 – 1993) and then assistant conductor of the Philharmonic Chamber Choir, Singapore (1994 – 2001) which won top awards at international choral competitions. Lai was pianist and assistant to the 500-strong Combined Singapore Choirs which performed in 1996 and again in 1999 on World Hospice Awareness Day, organized by the British Broadcasting Corporation, UK. She was also the official pianist at the Singapore National Choral Symposium in 2000. Her choir members work hard to learn the proper pronunciation and meanings of foreign words so that they can express the accurate emotions in song. She can never forget how her choir beat the Hungarians in their performance of a compulsory song in the Bela Bartok International Choir Competition, held in Hungary in 2000. This choir also won the special prize for interpretation. A German newspaper commented, “It takes a foreign choir to teach us to sing our own songs,” after the event. Vocaluptuous, one of Singapore’s top contemporary acapella groups, had one of its songs nominated for Best Holiday Song on album in 2002 by Contemporary Acapella Society of America, while Lai was their Music Director/Arranger (2000 – 2003). The group’s CD entitled, All Wrapped Up, a charity project mooted by the Singapore Rotary Club, raised funds to purchase a Mercedes van for the Singapore Society for the Physically Disabled in 2003. As conductor, pianist, accompanist and singer, she has directed and performed both locally and internationally in Malaysia, Singapore, America, Canada, France, Germany, Hungary, Italy and the United Kingdom. Last year, Prof Dr Pearl Shangkuan, featured Lai among five others in a paper she presented entitled “Women Composers Around the World,” at the 10th Choral Composers Symposium in Seoul, Korea. "I love this song," said Lai when I asked her why she chose Getaran Jiwa, a popular melody by P. Ramlee. Lai enjoys this song so much that she created eight different arrangements for voices, instruments and acapella performances. An 8-part acapella performance of this song by Time Ensemble, a group comprising alumni of the World Youth Choir, is available on YouTube. As a composer, Lai had her choral arrangements commissioned, published and performed by numerous choirs in concerts and competitions. Her 8-part acapella arrangement of the folk song, Potong Padi, published by American publisher, Earthsongs, was performed and used for Repertoire study at the Asia-Pacific Choral Symposium held in Singapore, National Choral Symposium in Australia and Germany, the American Choral Directors National Convention in San Antonio (2000) and at the Sixth World Choral Symposium in Minnesota (2002). Her 8-part acapella arrangement of, Burung KakaTua, was performed by the Hwa Chong Junior College choir at the World (Olympics) Choir Games and won in the folklore category. Lai recalls with pride that when the choir was invited to sing this song at the Champions Concert, they received a standing ovation from over 10,000 people in the audience! “The combination of a good choir and a good song, always works,” were the comments from the event’s panel of judges. Lai has a repertoire of arrangements for traditional Malay songs that remain popular with choirs and solo performers and in a SG50 show held at end Oct, a soloist performed her arrangement for, Sapu Tangan. The sky is the limit for Lai who continues to receive commissioned work to compose and arrange music for performances. While she is not conducting workshops and master classes, Lai is inspiring young students who are taught the finer points of piano playing through lessons with her. More than 600 participants at the recent Run4Fund charity run raised RM20,000 in aid of the Palliative Care Association of Johor Baru (PCA JB). For many participants who were non-golfers, it was their first time on a golf course when they completed the 8-km charity run on a route designed on the Melati course of the Palm Resort Golf & Country Club. 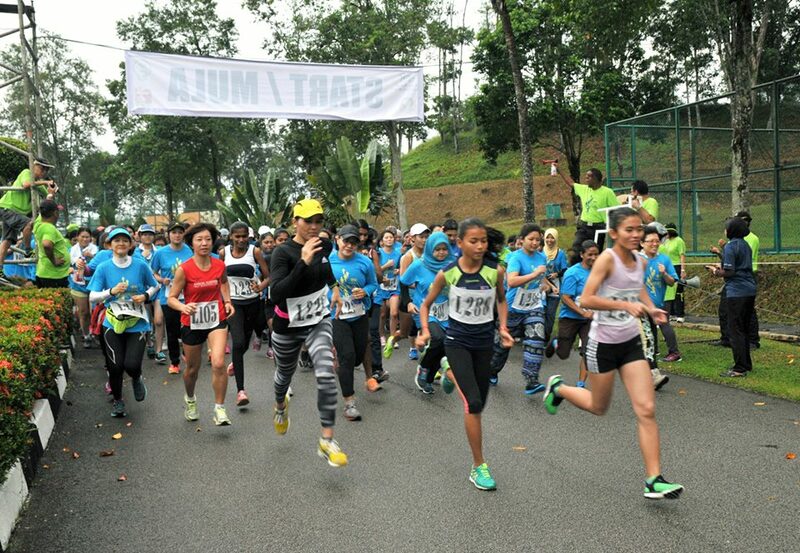 Jointly organised by Palm Resort Berhad and TJ Mart Kulai, the charity run on a route within the golf course aimed to give non-golfer participants the opportunity to have first-hand experience of a golf course while running in a safe environment, free from road perils. 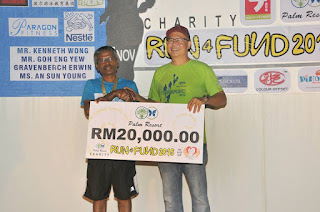 While the run offered only token sums of cash prizes of RM300, RM200, and RM100 for the top three runners in two categories for Ladies and Men, the response was overwhelming because it was for a good cause. Organising chairperson for the event, Daphne Ng, said they were worried at first because the response was slow and the recent hazy weather may deter people from participating. “But the response was so good that even after the closing date, we had to turn away registrations from interested people,” said Ng, grateful for the charitable hearts who supported their Run4Fund charity run. The charity run was flagged off at 4pm and all participants who completed the route, received commemorative medals. In the Men’s category, Simon Rotich emerged as champion, clocking 27.15 minutes while first runner-up, Mohd Jironi Riduan completed at a close 27.26 min and second runner-up, Muhd Zaqwah Mohd Yusuf clocked 29.58 min. In the Women’s category, champion Faradilah Raznie completed the route in 34.32 min while first runner-up, Sharmila Sivakumar clocked 35.45 min and second runner-up, Puspa Letchumy Jaintheran, 37.23 min. 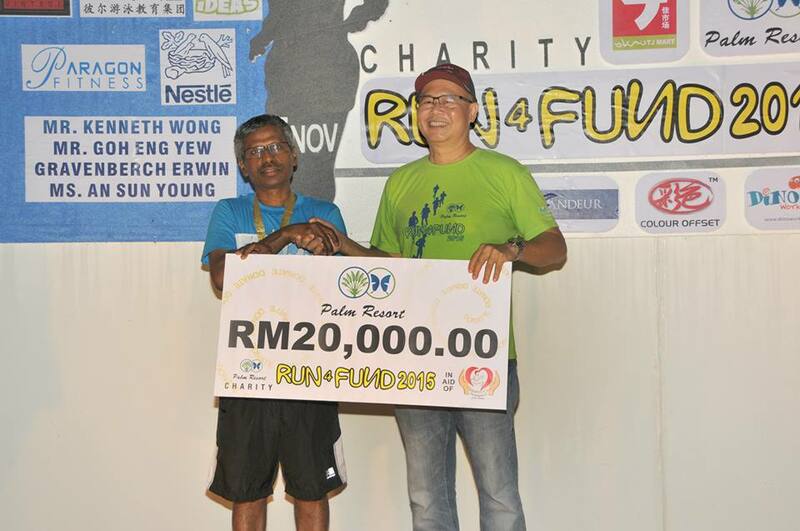 “We hope that this charity Run4Fund can be an annual event,” said Palm Resort Golf & Country Club CEO, Jef Kong when he presented a mock cheque for RM20,000 raised from the run, to PCAJB president, Dr Angamuthu Rajoo. Since its inception in 2007, PCAJB has been giving essential support free-of-charge to terminally ill cancer patients and their families. PCAJB provided hospice care for more than 250 patients last year and are keen to create greater awareness of their work so that more patients and their families can benefit from their services. Grandmother, Mak Cheng Hai, who passed away peacefully at the ripe old age 103 on July 2, left us with a treasure trove of experiences from the years we shared together. Besides a legacy of fond memories and mementoes, grandma’s life’s savings which she accumulated through her wise and frugal lifestyle, was a comfortable nest egg for her family. A day after she was buried next to grandfather, details of her will on the division of her estate, was read out by the lawyer in the presence of her children. Pieces of her jewellery that she had set aside for her daughters-in-law, were also distributed to her sons for their wives. Many years earlier I witnessed grandma distributing her jewellery to her five daughters. Seated around our dining table, grandma, who was then still lucid, specifically instructed that the items for her daughters-in-law, should be given to them after she was gone. These were put into individual hong-pau (red packets) with their names written on the outside and kept by my mum, gran’s eldest daughter, until that day when the will was read. I just admire grandma’s wisdom in her decisions for her estate because she looked into details and even ensured that the families of her children who were deceased, also received the share due to them. The executors of her will tallied the accounts for the final figure to divide and distribute her estate after the traditional 100-day ceremony for grandma. Almost as soon as grandma’s will was read, I received an email from cousin Malcolm saying that he and his sister, Eva, the children of late uncle Robert, have decided to use their share to bless the aunts and uncles who took care of grandma through the last few years of her long life! the elevator of our hotel! He is aware that we have honoured gran’s wish, (who made it clear that she did not want to be put in a nursing home!) and stayed with our family for almost 20 years, before moving to live with aunty Polly and uncle Steven in USJ for the next 8 years. With the departure for the 4-day 3-night trip from KLIA, I drove mum from Johor Baru to USJ for an overnighter so that we may leave together the next day. I had arranged to pick Mal on his arrival from Sydney that afternoon so while waiting, mum, aunt Polly and I browsed around the shops in Mitsui Outlet Park KLIA. Picnic lunch on Hong island - Note the paper boxes! As always, we found something to buy. When aunty picked a t-shirt that she liked, we decided quite spontaneously, to buy similar t-shirts to wear on our trip. This added to the fun and excitement as our time together was in honour of our late grandma. Later when we showed our same t-shirts to uncle Steven, he laughed and said that Mal should wave a flag to lead his tour group (us!) clad in these uniforms! The next morning, the husbands of our two aunts sent us to KLIA to catch our flight to Krabi. After checking-in our luggage, we kicked off our trip by eating a local breakfast followed by coffee and nyonya kueh before it was time to board. When we exited the airport after the short and uneventful flight from KL to Krabi, a limousine van-driver was waiting to meet us. relieved at the end of their ride! Our hotel in Ao Nang, Ananta Burin, is close to the beach and just a short walk to the main street which is lined by souvenir shops and restaurants. Mal, our able tour leader, suggested that once we checked-into our rooms, we should have a small meal before dinner. We headed across the road where we found three shops: restaurant, spa and tour desk under the same management aptly named, Feel Good. Our first meal in Krabi was snacks of Thai spring rolls, prawn cakes dipped in chilli sauce and pad thai (stir-fried rice noodles) washed down with Singha beer (for Mal!) and fresh fruit juices. The warm weather was cooling down for the evening as we filled our stomachs – we did not have any lunch – and discussed our itinerary for the next few days. It was generally agreed that in between massage sessions, there will be short excursions like island-hopping and elephant riding and of course, lots of local food. As we looked ahead to an exciting time in this meaningful trip, Mal proposed a toast to gran and we raised our glasses to toast to gran’s memory! I know she would have wanted us to enjoy this blessing from the thoughtful generosity of our cousins, Mal and Eva. Smart baby elephant trained to perform for visitors! Mal suggested that we plan each day’s activities day-by-day because the tour desk was nearby and we could select the type of tour and make reservations just a day ahead. When our stomach rumbling was silenced by this tea-time snack, our first stop was the tour desk to select an activity for the next day. In addition to an island-hopping trip to Hong Island the next morning, we also bought ourselves a trip to the Krabi night market that very evening. With an hour to spare before the 6pm pick-up to Krabi night market, the best option to kill time was to pop into the spa for a massage! It so happened that the Feel Good spa had a promotional rate on its menu of massages and it made sense to take advantage of this best deal when the therapists were skilled, pleasant and professional. In the next three days, we probably were this spa’s favourite customers. That’s because we were there almost daily to enjoy relaxing and rejuvenating therapies at the promo rates that they extended to us even after the promo period was over! Feeling refreshed after the massage, we hopped into a van assigned for our night market trip and headed to Krabi. Every Friday to Sunday, this night market is opened from 6pm and we were dropped off near a shopping centre, a few steps away from the street lined with stalls. Even before reaching the market, aunt Polly couldn’t resist buying a pack of toasted cashew nuts from a shop and opened it to munch as we walked along. steps to the shrine at top of this hill! The market looked very much like our pasar malam with sections for household items, knick-knacks and souvenirs as well as cooked food, fresh food and fruits. The aroma from the grilled skewers of seafood and whole fish was simply mouth-watering and quite irresistible. And it didn’t take long for us to start buying a few sticks to taste. The crowd was quite overwhelming and as it was quite impossible to walk comfortably, we were glad to discover a centre court where tables and chairs were set up in front of a stage where a live show was going on. Singers were taking turns to belt out Thai pop songs and dance artistes were performing to Thai techno music – played way too loudly! The tables looked like they were all occupied but after a short search, we managed to secure a table to sit at for our meal. Mal did not hesitate to hit the stalls to buy his favourite choices of grilled calamari and whole fresh coconuts while I ordered freshly made, green papaya salad or Som Tam and that tempting grilled whole fish for mum and the aunts to enjoy. We truly did justice to all the food and that fish because when they were done, what was left was just a clean skeletal comb of its centre bone! Fresh prawns in spicy seafood Tom Yam soup! After our first experience of street food in Krabi night market, we had no qualms about joining the locals (a day later) to enjoy street food, literally by the side of Ao Nang’s main street. We ordered same items like Tom Yam seafood soup, Som Tam and stir-fried noodles, among others but it was interesting to sample the different variations and presentations in the few days when we dined at a stall, café, restaurant and even a halal place. Someone said, “Time flies when you are having fun” and this was true as we filled our days with food and fun activities. On our island-hopping trip, we stopped at two islands before reaching Hong island. Here, we were surprised to discover that we had to disembark onto a floating pontoon and must walk on it to reach Hong island! It was a particularly challenging experience for me – and mum. Stumbling and trying to keep my balance while my stomach roiled with motion sickness, I had to hold and help mum maneuver her wobbly legs on a surface that was constantly shifting on a choppy sea. Meanwhile, Mal and the aunts were laughing their heads off at our odd way of walking, which Mal later confirmed, looked and felt exactly like when one was drunk! Mal later also admitted that it was quite harrowing to watch mum board and disembark from the speed boat, particularly when the weather turned gloomy and wet at the end of our day trip. In fact, he was even poised to dive into the sea to rescue mum if she missed her footing while boarding the boat! It was challenging to move from the jetty to the bobbing boat but mum who is 83, did so with agility and great care. Some of the boat staff were quite concerned as they helped us on and off the boats – three times. They respectfully called mum, “mama” and one brawny guy even offered to piggy-back mum to help her board the boat! When it was over, we agreed for no more boat trips and opted for a half-day tour to experience elephant trekking, watch a baby elephant show and visit Tiger Cave temple the next day. While the day’s activities seemed rather tame, our elephant ride was another adrenalin-pumping experience! Once again, mum showed amazing courage to climb on the elephant and sit with aunt Sylvia. Then it was a rocking-roller-coaster ride when the animals trekked up and down a muddy slope, through the jungle and into a pond, while we were losing our balance, our bottoms slipping and sliding off the smooth surface of seats perched on the elephants’ backs! So after jumping on and off boats in choppy waters and jungle trekking on elephant backs on slopes and into water, riding a tuk-tuk was comparatively tame. After browsing around the shops and eating a delicious local dinner, Mal thought that we deserved a chauffeur-driven ride back to the hotel. So we piled into a tuk-tuk, a motorbike fitted with a canopied side car, for a short but thrilling ride! One of the best meals we had must have been the dessert from street hawkers – mango sticky rice, banana/Nutella crispy pancakes and little apam-like kueh made from coconut milk the Thais call, kanom krok – which we shamelessly went for a second round on two consecutive days! Our adventurous ride in a Thai tuk-tuk! On our final day in Ao Nang, we had a hearty lunch at Bangboo Restaurant with mandatory items like Som Tam salad, Tom Yam soup and pineapple rice among other dishes and more fresh coconut drinks. No, we did not toast to grandma’s memory with our coconuts but we all agreed that it was an eventful trip. Our time together was indeed meaningful and memorable as Mal said a few words to formally thank the aunts for their love and commitment in the long-term caring of our dear grandma. Mal certainly enjoyed himself with us and even proposed that we plan another trip together. But after aunt Polly saw the video he took of mum and I balancing precariously on that bobbing pontoon, she insisted that the next trip must be relaxing and in a cooler climate but where we can still wear our “uniform” holiday t-shirts! Freedom Film Fest is here again! Shop at the IWA Christmas Charity Bazaar!